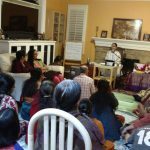 By the immense grace of Sri Swamiji, the second satsang in Bay Area with Porrnimaji took place at the residence of Sri.Swami Venkatraman and Smt. 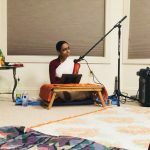 Nithya Nagarajan in Milpitas. The satsang commenced with rendition of the Mahamantra and our Swamiji’s Guru Kirtans. Poornimaji gave a beautiful explanation for the term ‘bhakti’ and the concept of “Mineness” towards God as well. She elucidated beautifully by giving various examples of this thought of “Mineness”. The precept that was conveyed was to have this thought of “Mineness” towards god as well. A simple example would be to consider the deity in the Pooja place of our home. 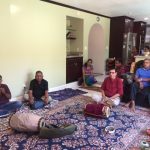 Once the belief that God is verily in that Pooja room and treat that deity as one would treat any one at home (for instance offering food to the deity before eating), then that becomes bhakti. When that devotee thinks that God is his and when he is in trouble then the God would think “Oh My Bhakta” is in trouble and that I should help him”. Poornimaji also explained about the concept of Ekantha Bhakti- “Love and affection towards one God”. It is good to respect different deities but having affection and love towards one God is highest form of bhakti. The greatness of Bhagavatha Dharma lies in the fact that it talks about love towards God, chanting the divine names and listening to divine glories of the lord. This path is indeed very apt for this age of Kali. 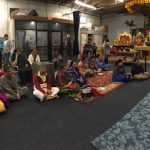 About 35 people attended the satsang. 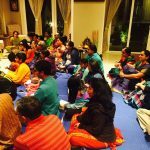 The satsang concluded with Nama Kirtan and Kaliyayum Bali Kollum kirtans.